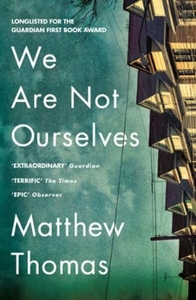 SHORTLISTED FOR THE JAMES TAIT BLACK PRIZE LONGLISTED FOR THE GUARDIAN FIRST BOOK AWARD NOMINATED FOR THE FOLIO PRIZE NAMED A NOTABLE BOOK OF THE YEAR BY THE NEW YORK TIMES A stunning, heartbreaking debut - 'We Are Not Ourselves' is both the intimate story of a family and an epic of the American Century. The product of a stormy upbringing in an Irish Catholic enclave of New York City, Eileen craves stability. Coming of age in the early Sixties, she meets and marries a young scientist named Edmund Leary. But while Eileen wants more for her family, Ed won't give up teaching for a better-paid job. Inadvertently Eileen starts to climb her own career ladder in nursing. She pushes Ed into finding a new home, but it becomes clear that his resistance is part of a deeply troubling psychological shift. In this masterful debut, Matthew Thomas paints a sprawling, profoundly sympathetic portrait of a family coping with slow-burning tragedy. 'We Are Not Ourselves' is a grand testament to our deepest hopes and most human frailties.